Notes: Based on the manga by Togashi Yoshihiro. This review is for the original 1999 TV series; the 2011 remake will be covered separately. Gon Freecs, a young boy living with his aunt on Whale Island, thought his father to be dead. That is until a chance meeting with the Hunter Kaito. It is through Kaito that Gon learns of the rich legacy of Hunters, people whom explore the unknown aspects of the world in all its facets. Gon also learns that his father, Jin Freecs, is not only alive but is in fact the greatest Hunter in the world. It is with this knowledge that Gon ventures out into the world with the goal of becoming a Hunter and finding the whereabouts of his father, all the while making several friends and having many adventures of his own. The lack of fandom surrounding Hunter X Hunter is somewhat enigmatic to me. It is a title that, by all rights, should have a huge buzz behind it. 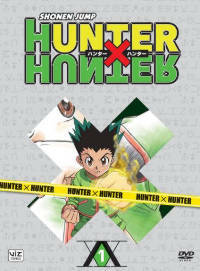 Not only is Hunter X Hunter the work of Yoshihiro Togashi, the creator of Yu Yu Hakusho, but it is also far superior to other currently running big-hype titles, the most prominent of which is Naruto. It manages to be enormously entertaining through its unique concoction of animation, characterization, and plot, without resorting to the cliches that have all too often ruined a seemingly novel show of a similar vein. And yet Hunter X Hunter remains little known. With any luck this review will have a hand in lifting the veil of obscurity that currently surrounds this magnificent title. To begin with, the story of Hunter X Hunter is vibrant and imaginative, though not at all difficult. Right from the start the aim of this series is made clear, the eventual reunion of Gon with his father. However, the path that is taken to achieve this end is full of twists and turns that continuously succeed in keeping this tale fresh. The viewer is ceaselessly wisked between offbeat situations as varied as the dangerous wilderness to a battle-stage tower with over two hundred floors of increasingly difficult fighting tournaments. It is through these atypical situations that we come to understand the motivations of our lead and become endeared to his cause. A superb level of attention in plotting is also dedicated to the other prominent cast members, including Gon's companions Killua, Leorio, and Kurapica. Though the centerpiece here is Gon, none of the supporting roles go underdeveloped. In fact the only problem with plotting is that the story takes a few episodes to really get churning. If you can make it to about episode six or seven though, you will be fully strapped in for one hell of a fun ride. A rather unexpected facet of this title is how lightly the plot focuses on fighting, especially given that Togashi’s most famous work, Yu Yu Hakusho, was often little more than a continuous battle-fest. To be certain, fighting does take place and at some points in the series it becomes quite prominent, but it never manages to wrestle the spotlight away from the fleshier portions of the narrative. Despite this, the action leaves very little to be desired. The fight-action sets here are more complex than the typical ki-blasting, as fast-as-light-movement farce that has become the industry standard for fighting anime. Instead we are treated to a truly creative power-leveling system and a diversity of combat styles that make each fight more than simply diversionary but instead truly engaging. It is as if the battle scenes have actually added to the tension and excitement of the plotline rather than flattened it, a rare occurrence indeed. Leaving just a bit more to be desired of Hunter X Hunter, however, are the peripherals. Musically, while not bad, HXH just does not manage to live up to its more palatial qualities. Still, the music is good enough and has continuously improved throughout the series. I have personally enjoyed the opening and closing music more and more with each successive theme change that occurs. Additionally the animation is mostly quite nice. It certainly isn’t spectacular by any stretch of the imagination, but it is visually appealing. There is also a definite change for the better in terms of animation the further one progresses through the show. The set pieces have strong appeal as well, and are reasonably effective at immersing us in this strange and phenomenal world. The most remarkable aspect of Hunter X Hunter, however, lies within its remarkable characters. Most of the cast here is not at all generic or formulaic, a welcome retreat from the chiefly derivative characters so prominent in similar shows. Gon, the show’s lead, is a charismatic young boy whose optimism and innocence is always invigorating without being imposing. An odd tidbit, Gon is virtually never the strongest character on the screen, by a long shot. A partial reason for this is that his goal isn’t necessarily to be the strongest being in existence but primarily to better himself. This is another big plus in the personality department that sets Gon apart from your conventional “Shonen Jump Hero Archtype”. Gon’s optimism is offset well by the darker, more brooding persona of Killua, a young boy that Gon befriends early in the show. Together they make for perhaps the most interesting pair of best friends in all of anime. Their companions, Leorio and Kurapica, also make for complex and interesting characters. Leorio is a man who, haunted by his past, is motivated to the performance of benevolent acts to the benefit of humanity. Kurapica, conversely, is motivated by revenge, though revenge is an ideal that is out of character for him. Consequently, Kurapica always seems to be a man at odds with himself. Equally compelling are the more contemptible figures of this tale such as Hisoka, Kuroro, and the rest of the Genei Ryodan. The interplay of these vastly different personalities is the bread and butter of Hunter X Hunter. It should be no secret that Hunter X Hunter has bewitched me. Beyond some very minor failings, it is nearly beyond fault. It carries with it a sort of energy and charm that is very intoxicating. To put it most concisely, Hunter X Hunter should be considered Yoshihiro Togashi’s new masterwork. Any less firm a designation would be an injustice against this superb animated opus. Recommended Audience: Mostly benign, this series can be a bit graphic at times. Should be viewed primarily by those thirteen years of age or more.